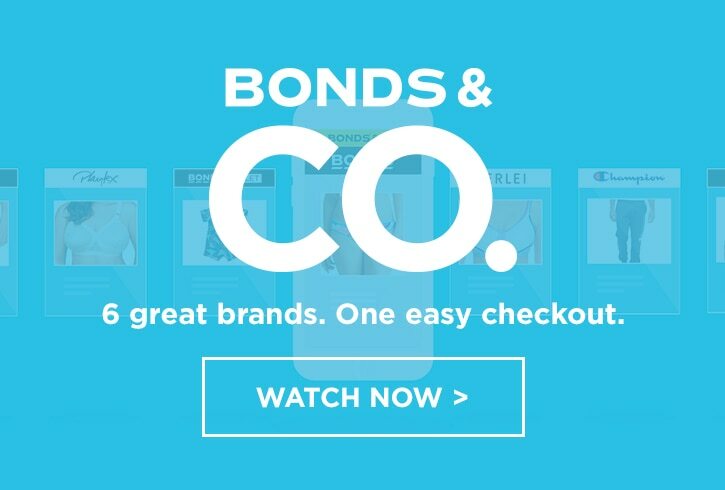 BONDS & CO. is the easy way to shop Australia's most-loved brands. It offers one simple checkout option so you can shop all your favourite brands at the same time. Free shipping on orders over $49 Australia-wide. *To redeem any member discounts you must be logged into each individual brand account before checking out. Why use BONDS & CO.? BONDS & CO. allows you to shop six of your favourite brands including Bonds, Berlei, Jockey, Champion, Playtex and Totaly Tights all at once. Everything is paid for, packaged up, and posted out together making it super easy for you to shop online. Will my member discounts still apply? Yes. To access your member discounts simply login into account, e.g. your Bonds account, then click the bar at the top of each page to toggle between brands and shop per normal. Loyalty program discounts only apply to the brands you are a member of. For example, if you are a Bonds 20% off member you won't also receive 20% off Berlei, etc. How do sale discounts work? Sale discounts and promotional offers will be calculated at the checkout for each corresponding brand only. This will be reflected in your shopping bag. Unfortunately, payment via gift cards for BONDS & CO. orders is not yet available. We’re currently in the process of setting this up, so do appreciate your patience. In the meantime, you can still use your gift cards in stores. How can I pay for my Bonds & Co. order at checkout? With Bonds & Co, you can return almost anything, provided it meets out guidelines, within 30 days via our online returns system. The shipping is free if you're in Australia. Exchanges and store credits are unavailable for Bonds & Co orders. Underwear (not bras) and tights can only be returned if faulty due to hygiene reasons. Personalised items can only be returned if faulty and not for change of mind. To start your return, you’ll need your order number, which you can find in your confirmation email or printed on the outside of your parcel (it is labelled as a P/O number). Click here if you want to create a new return request. For more information, check our returns policy here. Unfortunately, most of our brands can’t be shipped outside of Australia and New Zealand therefore our BONDS & CO. checkout system cannot be used for overseas orders. The good news is we can send Bonds items pretty much anywhere. Browse the full range now at bonds.com.au. Do you still offer free shipping? Yes. Free standard shipping is available on all Australian orders over $49. A flat fee of $5.95 applies to orders under $49. Standard shipping is free for orders over $60 AUD, when you shop more than one brand via Bonds & Co. A flat fee of $15 AUD applies to orders under $60 AUD. Does shipping take longer if shopping various brands at once? We use Australia Post eParcel to get your goods to you. Once your order has left our warehouse, standard delivery can take up to 7 business days. Please allow an additional 5 business days for personalised items to be delivered. We use DHL to get your goods to you. Once your order has left our warehouse, standard delivery can take up to 14 business days. Are there BONDS & CO. stores I can shop from? Currently, BONDS & CO. is only available online. Is Click & Collect available from BONDS & CO.? Because BONDS & CO. is an online service only, Click & Collect isn't available as a delivery option.